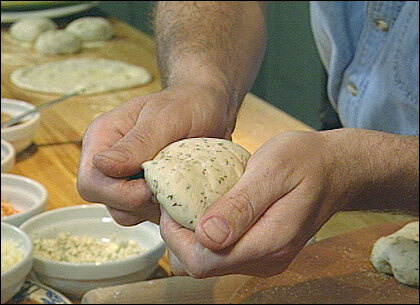 Roll out your pizza dough to the desired thickness. Spread the roasted garlic over the surface of the dough  this is your "sauce" for this pizza. 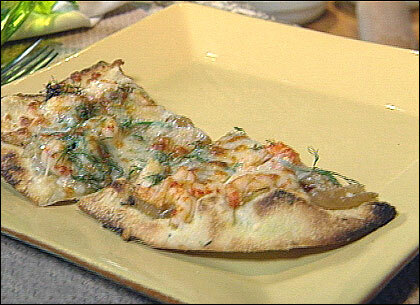 Sprinkle the cheese evenly over the dough, then add the crawfish, onions and fresh dill. Lastly, drizzle extra virgin olive oil over the pizza. Bake for 10 - 12 minutes, or until the crust looks crispy and the cheese becomes lightly golden. Horst Pfeifer notes: The amount of each ingredient is to your own taste. With pizzas, really anything goes; however, sometimes the simpler things work better, as overcrowding the toppings can cause the ingredients not to heat through evenly, resulting in a soggy pizza with flavors that blend into a mush.